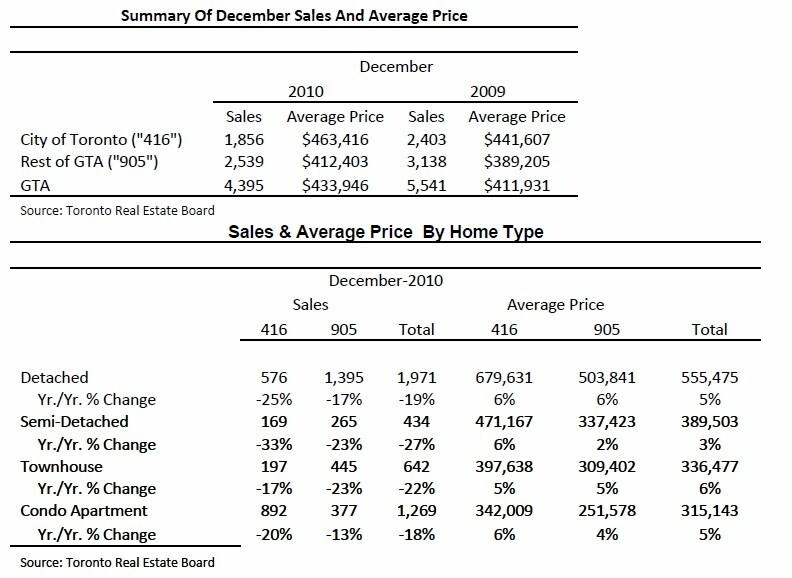 TORONTO, January 6, 2011 -- Greater Toronto REALTORS(r) reported 4,395 existing home sales for the month of December, bringing the 2010 total to 86,170 - down by one per cent compared to 2009. See the actual figures below. term," said TREB President Bill Johnston. "New Federal Government-mandated mortgage lending guidelines, higher borrowing costs and misconceptions about the HST caused a pause in home buying in the summer. As it became clear that the HST was not applicable to the sale price of an existing home and buyers realized that home ownership remained affordable, market conditions improved," continued Johnston. The average home selling price in 2010 was $431,463 - up nine per cent in comparison to the 2009 average selling price of $395,460. In December, the average annual rate of price growth was five per cent. "At the outset of 2010, we were experiencing annual rates of price growth at or near 20 per cent. This was the result of extremely tight market conditions coupled with the fact that we were comparing prices to the trough of the recession at the beginning of 2009," said Jason Mercer, TREB's Senior Manager of Market Analysis. "Balanced market conditions in the second half of 2010 resulted in more moderate home price appreciation," continued Mercer. 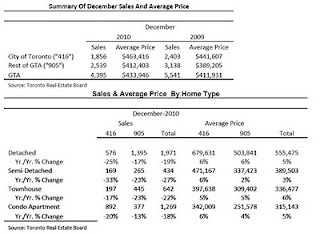 "Expect the average selling price to grow at or below five per cent in 2011. With this type of growth, mortgage carrying costs for the average priced home in the GTA will remain affordable for a household earning an average income." Home sales in the GTA were spread across a number of different housing types in 2010. Detached homes accounted for 49 per cent of total sales. Condominium apartments accounted for an additional 25 per cent per cent of sales. Other housing types including townhomes and semi-detached houses accounted for the final 26 per cent. In some areas like TREB's central districts the mix was quite different, with condominium apartments accounting for 61 per cent of total sales. "Ownership housing is available in a diversity of types and price points across the GTA, allowing plenty of choice for first time buyers and experienced home buyers alike. This housing diversity is one factor that continues to make the GTA a popular choice for households and businesses," concluded Johnston.